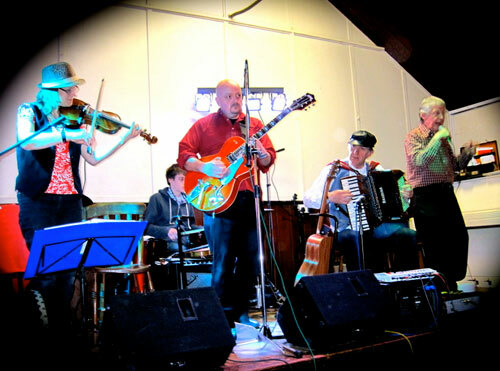 The musicians in this Devon Ceilidh band have been plying their trade all over the South West for well over twenty years and played at hundreds of parties, weddings, ceilidhs, barn dances, celebrations and festivals of all kinds. They know each event is special to you, and that makes it special for them too. 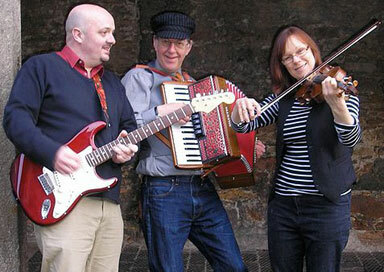 They play traditional English, Irish and Scottish folk music with a touch of Eastern European music to spice things up occasionally. Small band, big sound. How do they do it? They have a top class PA system as you may expect of an established dance band with many years experience, but there's no substitute for skill when it comes to playing for dance. A ceilidh needs musicians who can play with precision and also react to the dancers to create a great atmosphere and a truly memorable event. Please take a look and listen to their live recordings and videos and read the testimonials that will assure you of a great ceilidh band for your wedding, party, or other event. Better still come along to one of their public barn dances in Devon.